While Lemon claimed that he “hate(s) when people riot and loot and it happened in Katrina” and “personally urge(s) people to be peaceful and calm,” he also “understands” the illegal behavior. Alba immediately rejected the claim, retorting that “there should never be rioting.” In reply, Lemon reiterated how he “understand(s)” the behavior and how “it happens when people are frustrated.” The CNN anchor refused to condemn the rioting and looting outright. 3 minutes and 48 seconds. BROOKE BALDWIN: Alright, former NYPD. I mean, you see this story, we have covered other stories. We talk about use of force. We don't have all the details in this particular case. But what is your initial read? BALDWIN: We don't even know the race of the officer, by the way. LEMON: I disagree with him. I heard him. I think it, I think it doesn't matter to me, because you can still be co-opted by a corrupt system. If you're a member of a police department and you’re for the most part – if you’re a member of a police department and you have corruption in the police department or you see people being treated certain ways, you can be co-opted by that, and you can -- it can rub off on you. You can start treating people the same way. It doesn't matter to me. Yes it does, but for the most part, I don't think it matters to me what color the officer is. And I think that takes away from exactly what's going on. For me, this is about the treatment of men of color in our society. They're treated differently, whether it be law enforcement, whether it be at work, whether it be at a grocery store, on the street. They are treated differently, and they have a different level of respect. BALDWIN: So looking ahead, listening to the police chief earlier, talking to McKay Len Berman, talking about use of force issues in police departments. And he said, listen, obviously we'll come to find the truth and what happened. But he said we'll use this incident as a training opportunity. My first thought was, all this training keeps happening, right? Again, we don't know what happened here in Ferguson. But how would you train that, with the issues of authority? LEMON: But it's happening, it’s happening because of what I said. Everyone keeps saying training, training, training. This is about people not realizing that there is a double standard that people live in a different world. And quite frankly, for white people to realize that black people, especially black men, are treated differently. It is a double standard. Until people realize that, nothing is going to change. BALDWIN: Part of LZ Granderson’s point, we're talking to him next hour but Gil I want to hear from you. ALBA: That’s not going to change soon though. So it’s really what we're talking about is the police and the community. ALBA: And, you know, what -- did this cop stop somebody for jaywalking, guy puts his hands up and he shoots him 15 times or something, you know? How absurd is that? I really don't think that particular thing happened. The other police say that he was in a car, struggling for the gun. I mean, if he was -- in fear for his life, then some kind of action was taken. So they have to balance those two off and see which is really right. I don't think anybody is going to stick up for an officer who shoots an18-year-old kid and kills him with several shots. BALDWIN: In time, the truth will emerge. LEMON: Can I say one more thing before we go? When we’re talking about the rioting, yeah, it's terrible about the rioting. I agree with LZ, I hate when people riot and loot and it happened in Katrina. But when people are put in dire situations, you don't know how they are going to react. I’m not saying it’s right, I personally urge people to be peaceful and calm. I'm not saying I agree with him, but I understand. ALBA: There should never be rioting. LEMON: They react. As I said, I don't agree with them. But I understand. ALBA: Yeah you can’t understand them. LEMON: I do understand it. 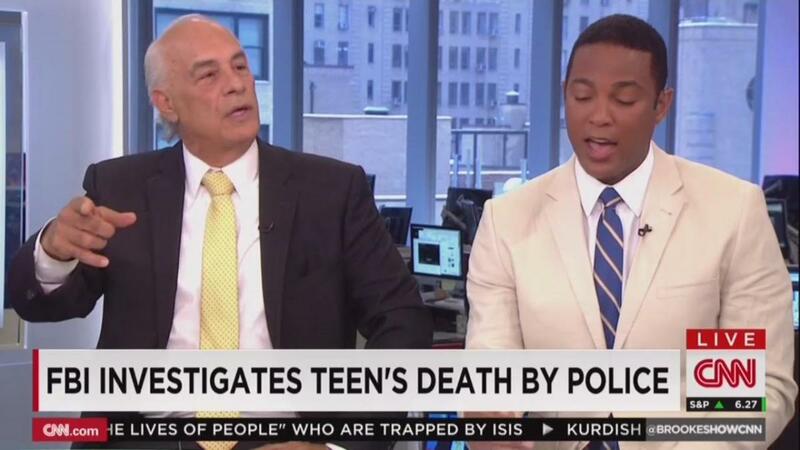 BALDWIN: Don Lemon, Gil Alba, thank you.